Possessing the proportionate strength and speed of a spider, high-schooler Peter Parker patrols New York City as Spider-Man, using a pair of web shooters he designed and built himself. And so we come to the new Spider-suit. Wow. I agree with what was said months ago: the suit was changed for no reason other than to say it had been changed, and that's not a good enough reason to change something. 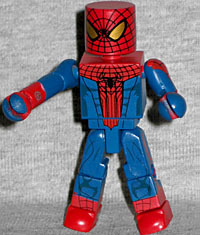 The Minimate does a decent job of duplicating the design, but there are made-up ToyBiz Spider-Man costumes that I'd rather see Minimatized before this thing. Why are the eyes golden? Why are there weird swirls on the limbs? The fact that his webshooters are painted is neat, and thankfully AA decided to skip the silver soles of his shoes. In the '60s, Peter Parker was a nerd, which made him an unlikeable outcast among his peer group. Now that nerds are kind of cool, how do you convey that same outsiderness? By casting the weirdest-looking human bobblehead you can find. The Minimate's clothes are right - a grey jacket with multiple pockets, long-sleeved blue shirt pulled down over his thumbs, etc. - but outside of molding new pieces, there's no way to accurately portray Andrew Garfield's goofy-long neck. They attempted to capture the look of his stupid emo hair, but it's about half the size it would need to be. 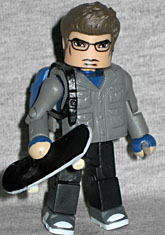 Pete's accessories include a skateboard and a backpack. Since he (like every child in America) only wears his backpack over one shoulder, it's glued to the jacket; that was the only way to get it to stay on. The set also includes a second head, and the only difference is that this one isn't wearing glasses. It's possible this is meant to allow us to create an unmasked Spider-Man, but there's no way he'd be able to fit his giant hipster afro under the mask.